The last two finals of the season in the Blyth & Wansbeck Sunday League took place at Morpeth Town’s Craik Park. The morning final saw Newsham Victory take on Block and Tackle Ashington. Block and Tackle were looking two lift their second trophy in two weeks and they took the lead when they were awarded a penalty. Steven Patterson stepped up and slotted home. Newsham came more into the game but they failed to take their chances and at half-time it remained 1-0. Newsham started the second half on the front foot and looked the more likely side to score. On 65 minutes Craig Frazer scored for the Vic, and both sides then produced the best football of the game as they went in search of a winner. Ross Jeffrey slotted in to put the Tackle back in front, buyt with 15 minutes remaining both sides were reduced to ten men after each having a player sent off. In extra-time it ended 2-2 and so it went to a penalty shoot-out, where the Block & Tackle won 4-2. The afternoon final saw Ashington RAOB looking to lift another trophy after their win last week. This time they were up against Amble Tavern in the George Davison Cup Final. However, it was Amble who made the better start and they went ahead after eight minutes. The Buffs keeper made a save from Mathew Graham, then somehow the player kneed the ball into the net over the keeper. On 15 minutes the Buffs were reduced to ten men with a player being sent off. Ten minutes later Mathew Graham scored with a trmendous shot giving the keeper no chance. This gave the Tavern breathing space and control of the game. In the second half there still wasn’t a lot between the sides, but with no further goals Amble went on to lift the trophy. League Chairman Colin Douglas thanked all the supporters for turning up. He also thanked Morpeth Town Football Club and staff for the use of their facilities. 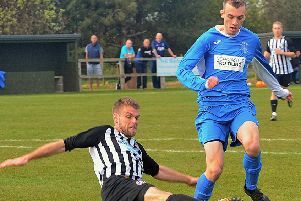 In the Premier Division Ashington Town Central had a good win at home against Blyth Town Sunday winning 3-1. Only game in Division One saw High Street complete the double of North Blyth Bar. with a resounding 10-1 victory.